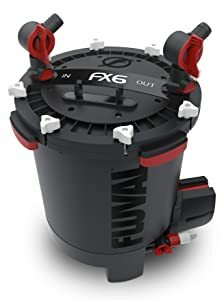 Fluval FX4 and Fluval FX6 are in the Fluval FX series, they are high performance external canister filters from Hagen Fluval. These filters have almost similar features; however, while the Fluval FX4 is smaller and only handle aquariums up to 250 US gallons, the Fluval FX6 can be used on extra-large fish tanks up to 400 gallons. 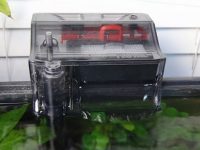 Like the Fluval 06 series used for smaller tanks, the Fluval FX series are very easy to set up and maintain that you can see in this review. The most advantage feature of Fluval FX series is the multi-stage filter system with stackable media baskets which is engineered to eliminate water by-pass for efficient filtration and less maintenance. The multi-stage filtration completely filters your aquarium water by all three filtration types mechanical, biological and chemical. Mechanical filtration (by Foam pads): Each of the three main media baskets is lined with a foam insert that allows for the most effective mechanical pre-filtering. 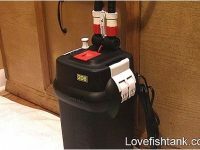 Biological filtration (by Bio-foam and Biomax): aids in the breakdown of toxic compounds for your fish such as ammonia and nitrite. 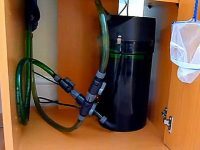 Chemical filtration (by Carbon foam): trap some organic compounds such as Phosphate and Nitrate that ensures your aquarium water clear and prevent the outgrow of algae. You can choose your prefer media or buy ones that come with the product to replace the old filter media. 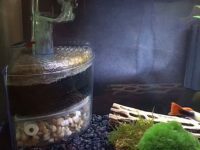 You can also use more biological filter media as you want to keep the water free of nitrogenous toxins and your fish healthy. I personally prefer to use as many Biomax as possible that helps my fish healthy and live for a long time. 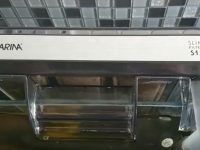 The maintenance of Fluval FX4/FX6 filters is very simple because the filter media baskets can be stacked in a layer combination and are very easy to remove for the cleaning. Besides, there is an instant-release T-bar handle that lets you lift all the baskets easily for the maintenance much simpler and faster. Automatically evacuate and prevent the trapped air from building up within the filtration system every 12 hours for maximum filtration efficiency.  Smart Pump™ – advanced microchip technology is the heart of Fluval FX4/FX6 canister filters that provide the filter many powerful and automatic features. The technology constantly monitors the entire pump, while continually measuring its force and impeller speed to maximize efficiency in energy use as well as power output. Moreover, it enables the most effective control of the autonomous start feature of this filter. It also engages in automatic air evacuation that works to prevent air from building up within the filtration system of the device. The pump also pauses momentarily to enable any trapped air to escape, therefore enabling a routine realization of the desired filtration levels. What you need to do is just add water to the auto-starting filter to start off the unique plug of the smart pump technology and everything will then pick itself up from there onwards. Self-priming without manual siphon – just add water, plug in and the Smart Pump™ will do the rest. 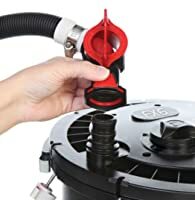 Purge valve with a drain hose near the bottom of the filter is designed for easier flushing of the canister and water changes without lifting heavy buckets. This hose can also be used to drain some water out of the filter to make it a lot lighter to move if you have to. Adjustable multi-directional output nozzles return the purified water to the aquarium in different directions that ensure the good circulation and continuously pull the new produced wastes into the filter. Versatile intake with telescopic stem and anti-clog strainer prevents the clog inside the canister by the large wastes, ensure the constant water flow, and protect your fish from being sucked into the filter. Large filter capacity is capable of accommodating a huge amount of filter materials for better filtration and less maintenance. Rubber feet reduces vibration and provides quiet operation. Aqua-stop valves with leak-proof Click-Fit attachment system make maintenance easier by shutting off the water flow without leaks and messes. The valves are placed at 45-degree angles and easily rotate about their positions to make sure that your installation becomes fast and easy.  The complete package comes with everything you need to set up the filter so you only need to connect and then start the filter. They include: filter canister, pump unit (motor) and power cord, filter lid, lid fasteners, media baskets, 1/2 media baskets, rubber hosing, rim connectors, clips and suction cups, intake stem, output nozzle, utility valve and hosing, drain cap, rubber feet. If you are looking for a filter for your large fish tank, the Fluval FX4 and Fluval FX6 are dependable and durable external canister filter worth for the money. You can also download and read the instruction manual to know more about these filter before making your decision.